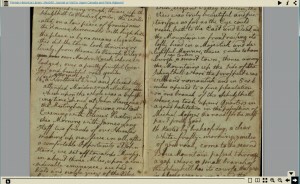 Joshua Sharples documented his 48-day journey through Pennsylvania and New York in his journal titled “Visit to Upper Canada and Parts Adjacent”. Sharples and his fellow Quakers Jacob Lindley, James Wilson, Oliver Paxton, and James Langstaff left on October 12, 1797 and returned to Chester County on December 1, 1797. They spend most of their trip meeting with other Quakers and former Friends, but did pass through a Seneca village on Tonawanda Creek.